Ouch I'm so sorry to hear that! The Hourglass formula also flakes on me after food. I think the oil breaks the formula down in a bad way. You picked up some great stuff. 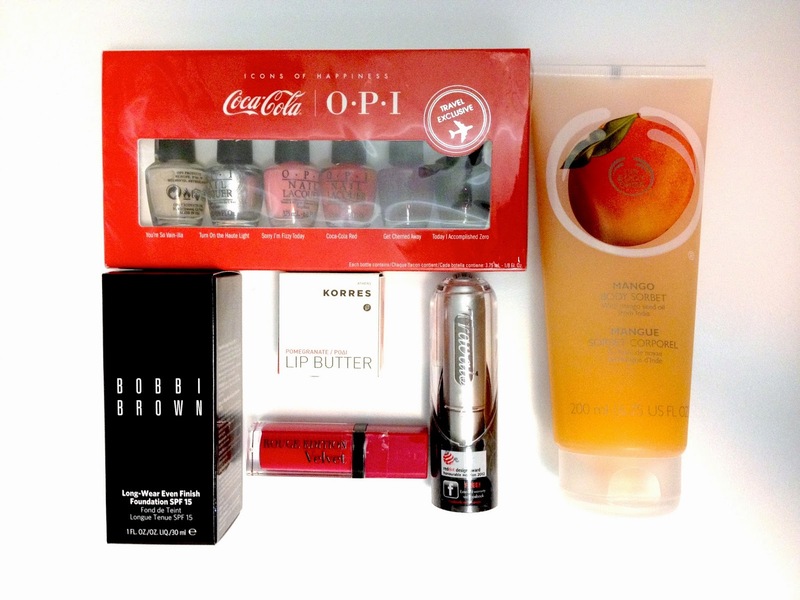 Duty-free/Travel Exclusive items are so fun. Our stores at home carry them because we are considered one of those jurisdictions, but we never get new stuff. I feel like it's the same travel items for years and although some of it is nice, it would be so awesome to have access to things the OPI set you picked up. Actually, I think I am going to start a new series of Duty Free/Travel Exclusives sometime in October. What do you think? Anyway, it's so cool that the Sephora's in Europe carry Bourjois! Though I see from your comment below that it's flaking off your lips so not cool. Finally, yes, I would LOVE to hear your thoughts on the Bobbi Brown foundation! Not tried much from that brand either. Body Shop, Body Shop, Body Shop! Lovely haul! I love the shades of the OPI polishes! Those Korres Lip butters are SO Incredable! I love the one I have so much!! I love those body shop sorbets, must try the mango one!